You know those Transition eyeglasses that automatically darken in the bright sunlight then return to normal indoors? The process that makes Transition lenses possible is called tenebrescence, otherwise known as reversible photochromism. Tenebrescence is not a man-made invention developed strictly for sunglasses. It occurs naturally. Some minerals, including hackmanite, have the ability to change color when exposed to the sun, and then change back when put into darkness. A rare gemstone, hackmanite is an example of tenebrescence in the natural world. Hackmanite is a type of sodalite, a royal blue gemstone that can be translucent or opaque. Sodalite was so named because of its high sodium content. Sometimes compared to lapis, sodalite is distinguishable from lapis because of the white streaks that run through the mineral, instead of the blue streaks that are in lapis. Hackmanite is a relative newcomer to the gemstone world. It was first discovered in Greenland in 1811 by L.C. Boergstroem but it took eighty more years before the mineral was fashioned into jewelry. That is because a vast deposit of hackmanite was unearthed in Ontario. Another deposit was discovered in 1991 in Quebec. Hackmanite has also been found in Burma and Afghanistan. Hackmanite was named for Victor Axel Hackman, a geologist from Finland, one of the first scientists to study the unusual properties of the stone. Hackman determined that the photochromism, or tenebrescence, in the mineral is the rarest of all of the optical phenomenon noted in gemstones. When hackmanite is first pulled from the ground, it is a deep violet color. As soon as sunlight hits it, the color changes to a grayish-white or greenish-white color. This change happens fairly quickly, within seconds of sun exposure. The original blue-purple color returns to the gemstone if it is placed into darkness. It takes much longer for the color to return, however. The stone may need to stay in the dark for as long as a week. The tenebrescence process can be repeated again and again with no decrease in the brilliance of the color. The only thing that puts an end to the process is heat. If the mineral is exposed to high temperatures, the color remains permanent. 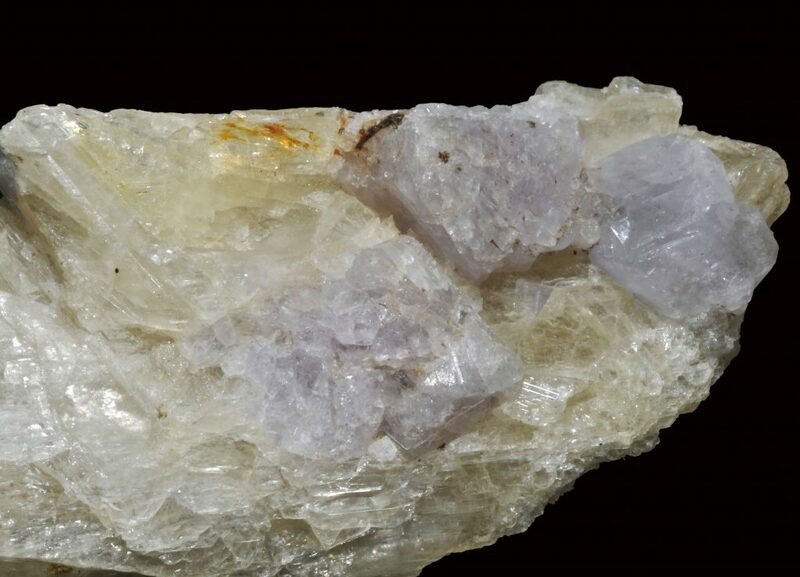 Hackmanite is unique among gemstones in its mineralogy. As a gemstone, hackmanite is groups with feldspars, although it has a lower silica composition than other feldspars. On the Mohs scale, hackmanite has a hardness of 5.50 to 6.0 and it has a lower density than most gemstones. For jewelry use, it is often cut into slices. When used as a gemstone, hackmanite cannot be treated because temperature increases kills the tenebrescence effect and it should be stored in a cool, dark place when not worn. In truth, most hackmanite jewelry is not worn at all, but are collector pieces for lovers of rare and unusual gemstones. 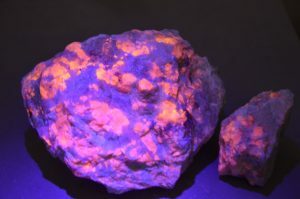 We are accustomed to seeing the effects of sunlight on living things, particularly plants, but it is unusual and quirky to see how the ultra-violet rays of the sun impact non-living objects, like rocks and minerals. Hackmanite shows us that sunlight is a catalyst for change. “Hackmanite Gemstone Information,” Buy Gemstones: Semi Precious & Precious Stones. GemSelect. 22 Jan. 2014. Web. 24 July 2018. “Tenebrescent Gems,” Classic Gems. 2004. Web. 24 July 2018. “What Is Tenebrescence?” Miner Shop; Tenebrescence. 2017. Web. 24 July 2018.